For the first time ever, I will be spending Thanksgiving away from my family. Oh sure, there was that Thanksgiving in college where my sister and I were both in London and we ate the most expensive turkey dinner ever at the only 'American' restaurant we could find (and trust me, that Hard Rock Cafe dinner was not worth 40 pounds). I suppose that wasn't really the sort of Thanksgiving meal we were accustomed to, but at least we were together. Other than that one year, I have always travelled home for Thanksgiving, whether that meant a 3-hour drive or a 2,250 mile flight; the holidays are special to me, and if you have been around here awhile, you know that my family means everything. This year, when I realized I wouldn't be able to spare the time away from work to head home for Thanksgiving, I would be lying if I told you I wasn't sad. The closer the holiday gets, the more I am yearning for white flakes of snow, long conversations catching up with family, and a warm hug. But though I regret that I will not be at home, I have no intention of wallowing in self-pity. I will be spending the big day with a wonderful friend and her family, and I will get to play with children and eat to my heart's content. Also, I might have decided I needed to soothe my sadness with baking. And sugar. And fall flavors. That's a cure-all right? So here's the crazy thing, I also have advanced in Foodbuzz's Project Food Blog to Round 8 (happy dance, happy dance!) where we were tasked with creating a baked good with pumpkin. The timing couldn't have been more perfect, and with my longing for home and family and the holidays around the corner, my mind was brimming with ideas. I was certain I wanted to bake with real pumpkin, and my initial thoughts drifted toward a beautiful spiced layer cake. Yet...it just didn't quite fit my mood and no matter how hard I tried I couldn't get myself invested in the idea. And then suddenly I realized why I didn't want to make a cake: It just didn't feel like home. So for starters, when I say I wanted bread, I meant I wanted real yeast bread; not the banana-bread or zucchini-bread-type that is really a cake masquerading as a bread, but the rather old-world-style European loaves of bread. I know some people have apprehension about working with yeast, but after years of watching my grandma knead bread and shape hundreds of loaves, I realize that the simple ingredients and oven baking never make exactly the same loaf of bread twice. This is good news for perfectionists like myself, because it means your bread can never truly be perfect, it will only be uniquely yours. And sure, there are a few ways you can really botch up your dough, but following a recipe usually ensures success. Have no fear. That is my motto. To make my bread recipe uniquely mine, I did two things: First, decided to make my own pumpkin puree rather than use canned pumpkin. As food aficionados, I think many of us might make the same choice, and I can tell you that it was totally worth it. Having real pumpkin amazingly enhanced the taste of this bread and gave it a real depth of flavor. (And I can tell you this for sure, because I also made a test loaf with canned pumpkin for comparison. I didn't tell my friends that the loaves were not the same, and they could taste the difference!) The second thing I did to change this recipe was to adapt it from using instant yeast (bread-machine yeast) to use dry active yeast. I don't know about you, but I only ever have dry active yeast at home, so a recipe with instant yeast is not useful for me. I made a few loaves each with instant and dry active yeast, and both turned out great, and I listed some of the major differences in the recipe below. As I was making my bread, I decided to really channel my grandma, and make the dough into traditional shapes such as braids, wreaths, knots, and dinner rolls. I was thrilled to pieces with the way they turned out, and I know the golden color and dense crumb would have made my Omi proud. And do you know what the best thing about this bread recipe is? It is crazy versatile! As you can see here, I made it into four different shapes without any extra stress or changes in the recipe, and then I went ahead and used it for bread pudding. I am hoping that later in the week I can show you how you can use it to make even more things! Ladies, think of this recipe like that 7-way dress that can fit every occasion. Men... think of it like that white t-shirt that you wear everyday for 7 days (when you think no one notices). Ok, before I get super long-winded here, can I just wrap up by telling you about this sinfully good rum raisin pumpkin bread pudding? I originally found awesome bread pudding recipes here and here, but I wanted to make a few changes. Of course, I wanted to use my pumpkin bread, but I also wanted less cream, rum-soaked raisins, and a butter rum glaze. (No, you are not dreaming, I definitely said 'rum' in that last sentence twice, and once I even said 'butter rum.' Are you drooling yet?) Sorry kiddies, that means this bread pudding is not for you, but more of a luxury for moms and dads. If you plan to make this recipe for a family occasion, just adapt it as needed, maybe consider a caramel or vanilla creme sauce. So I know you want to hear it, just how good was this bread pudding...Not to toot my own horn, but it was everything I wanted and needed and more. The custard set perfectly and was warm and soft, and the bread soaked up just the right amount of liquid so it was gooey, but yet the top still had a slight crunch. The sweet aroma of fall spices during baking was intoxicating (or was that the rum? ), and made me feel like I was right back at home in my family's kitchen. The bread pudding alone was fantastic, but adding the butter rum glaze and also some cinnamon whipped cream took it out beyond amazing. I seriously felt like I melted into my chair when I took a bite. My friend (I won't name names and subject her to potential embarrassment) was actually licking the bowl with the glaze, and eating just the whipped cream and glaze alone. If this doesn't tell you how good it was, well, I don't know what else to say. I know by now you probably have your whole Thanksgiving menu planned, but if you are hunting for a last minute dessert I would whole-heartedly recommend this. When pressed for time, you can just make it with any old bread and canned pumpkin and have it in the oven in less than 20 minutes. 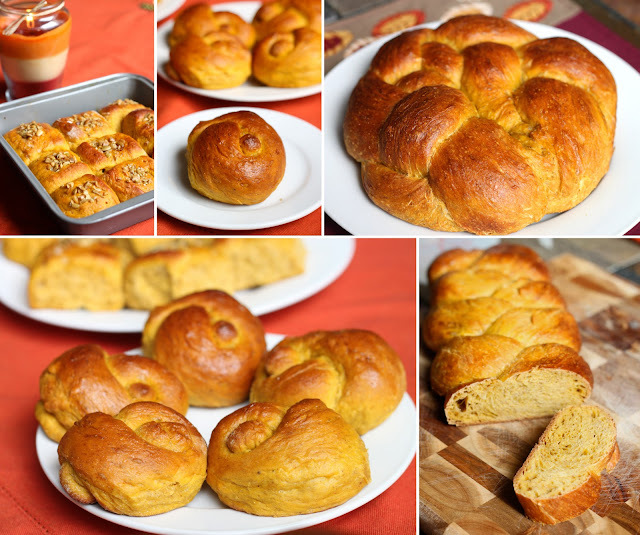 If you want a more elaborate and authentic undertaking, puree your own pumpkin and make your own bread and then give this recipe a go. I can't promise that it will make up for a missed Thanksgiving at home, but I can guarantee you that it will bring a little bit of home and comfort to you. ***This is my EIGHTH entry for Project Food Blog challenge (can you believe it!). For this challenge, we were asked to create a sweet or savory baked good featuring Pumpkin, and tell you what inspired us to create it. For my entry I wanted to channel my feelings of home and family into a dessert that used bread-making skills I learned from my grandmother to make a bread pudding that truly showcases the fall flavor of Pumpkin. I hope you get to enjoy the holidays with your family and friends and that you will be inspired to make a pumpkin dessert yourself! If you liked this post and enjoyed my dessert I would LOVE it if you would vote for me! You can check out my profile on Foodbuzz , view my past entries, and vote starting 6AM PST, on Monday, November 29th. Thanks SO much for your support and encouragement! Preheat oven to 350 degrees, and line a baking sheet with foil. Using a large knife, carefully cut a sugar/pie pumpkin in half, and scrape out the seeds (reserve seeds if you want to roast them later). 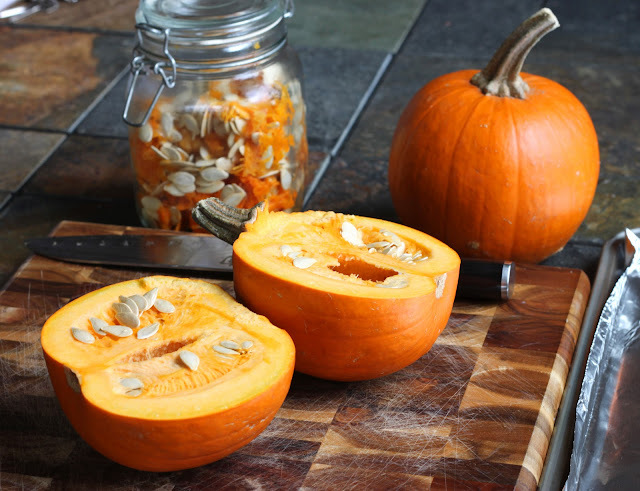 Place the pumpkin cut side down on the foil-lined baking sheet, and roast them for approximately 45 minutes, or until the pumpkin flesh is tender and soft. Cool until you can safely handle the pumpkins, and then scoop out the flesh; using a food processor or blender, puree the pumpkin flesh until smooth. King Arthur Flour recipe, with instant yeast: dough rises less, finished bread loaf is more dense, less springy, but more moist. My adaptation, with active dry yeast: dough rise MUCH more, finished bread loaf is less dense and bread is soft and springy, but less moist. Take your pick, but both worked great for me! You can find the original recipe on the King Arthur Site, and my version below. Heat milk to between 110 and 115 degrees (warmed, feels not too hot on the back of your hand) in a small bowl; stir in the active dry yeast, and let stand for at least 5 minutes. Meanwhile, in a large bowl, combine the first 6 ingredients, and mix well. In a separate large bowl, lightly beat the two eggs, then stir in the melted butter, and the pumpkin puree. After the yeast has been activated, add it all directly into the large bowl with the wet ingredients, and stir to mix. Then add 1/2 of the dry ingredients (flour and spices) from the other large bowl, and stir to mix the dry and wet ingredients together. After it is well mixed, add the remaining 1/2 of the dry ingredients and stir again. -To make a braid or a wreath, first divide the dough in half, and set one half aside. Take the remaining half, divide it into three even portions, and roll out each portion into a long, thin log (about 18 inches long). Pinch together one end of the three logs, and then braid the free ends together, pinching the braid closed at the end. To make the braid into a wreath, coil the braid into a circle, and transfer it to an 8-9 inch square, lightly greased baking pan. -To make dinner rolls, lightly grease an 8-9 inch square baking pan. Working with 1/2 of the dough, cut off evenly sized portions and roll them into balls that can fit into your palm (they don't need to be perfectly round, or even round at all). Make either 9 or 16 dough balls (depending on the size of your pan), and space them in the pan so they are just barely touching the sides of one another; they will expand during the second rising time and during baking to completely fill the pan. -To make knots, follow the same directions for making a braid, but roll out each log even thinner and longer; for me, it helps to roll out each log to a medium thinness first, then cut it in half again, and roll each smaller piece until it is more thin. Cut the thin pieces into ropes that are about 8 inches in length, and tie each rope into a knot, pulling the dough through the knot hole. 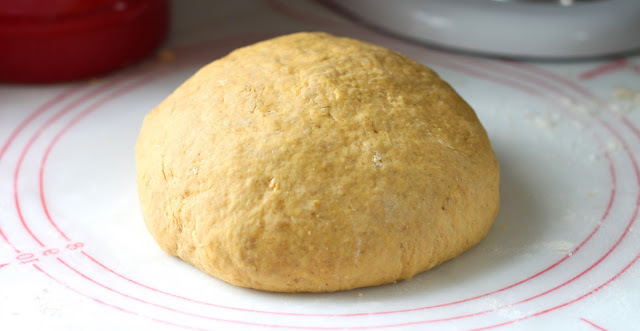 After your dough is shaped, cover it loosely, and let it rise for another 1-1 1/2 hours. Meanwhile, preheat your oven to 350 degrees Fahrenheit. Once your bread is ready to bake, brush the top lightly with the egg wash, and sprinkle dinner rolls with chopped nuts or pepitas if desired. Bake bread for approximately 30-35 minutes, until browned, or until an instant read thermometer inserted in center reads 190 degrees. Remove the bread from the oven and allow to cool on a rack. While bread pudding is baking, make butter rum glaze by melting butter in a small saucepan over low heat, and then slowly whisking in the remaining ingredients. Keep warm until serving over very low heat, or transfer to bowl for reheating in the microwave. Make cinnamon whipped cream by whisking heavy cream to soft peaks, and then adding cinnamon and sugar, and whipping to stiff peaks. Serve bread pudding warm, topped with cinnamon whipped cream and drizzled with butter rum glaze. Oh wow!! That is a beautiful dish! The bread sounds amazing on its own, but to then make it pudding! Over the top awesome! Beautiful post! this is unbelievable! i want to make this for thanksgiving! truly a beautiful post, great job!!! Wow !!! Not being American, for me "pumpkin" cooking is something new, and its variety just amazes me!!! Lovely job !! Home feeling ! Congrats! I think my knees buckled just reading this. And I've got pumpkin puree in the freezer, all ready to go! I think I better get to work. Wow, the pumpkin bread is absolutely gorgeous! And the pudding is just perfect with the raisins and the rum glaze, heaven! Happy Thanksgiving to you!!! Yum. Beautiful shaped loves. I love the braids. I'm with you 100% on the difference real pumpkin makes! Congrats on making it to Round 8 on PFB! WOW, this is so impressive, i'm drooling as i type. and i love that you made it into so many shapes. WOW. Great job! I'm reading this before breakfast... bad idea :) Good luck!! Gorgeous! I looooooove pumpkin bread, but the pumpkin bread pudding is even awesomer, what with all that rummy goodness. 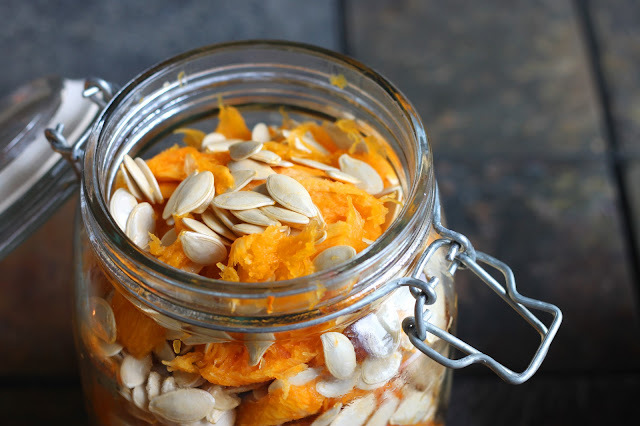 Considering I have a ton of leftover pumpkin from my entry, I'm totally going to try it out this weekend. If this is any sign of what the Challenge 8 posts will look like, this is going to be a tough round indeed. Way to bring your A++++ game! Hmmm... that white t-shirt comment sure does make me think of a certain T. You can decide which one. ;) Also, maybe I shouldn't admit this, but, um, after I emptied my leftover bag of glaze, I turned it inside out and licked the rest. I might have a problem. Glaze addiction. Your pictures are always so lovely! I'm with you.. I hate spending my holidays away from my family- for the past couple years we spend Tgiving with the boyfriends fam and Christmas with mine but its still hard! Your breads are gorgeous and if I wasnt having to finish up a wedding cake tonight I would be making it for tomorrows dinner!! Happy Thanksgiving!! Ahh!!! I just drooled into my keyboard! Looks soooooooooooo amazing! Congrats on Round 8! This looks divine! 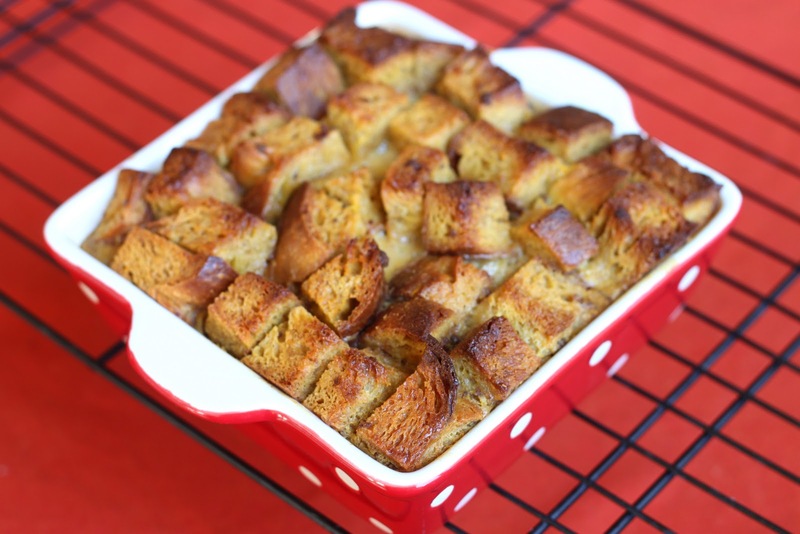 I've been wanting a good bread pudding recipe and this is definitely it! Love the addition of the rum glaze, beautiful and well done! This is my first Thanksgiving away from family too. It's a big change and baking is surely the best way to adapt! Your bread is gorgeous! What a beautiful color - and I love all the different shapes. Grandmothers are the best kitchen inspiration. Love this ACTUAL pumpkin bread! You're smart :) I love the pumpkin bread bread pudding as well! Very theme-oriented! 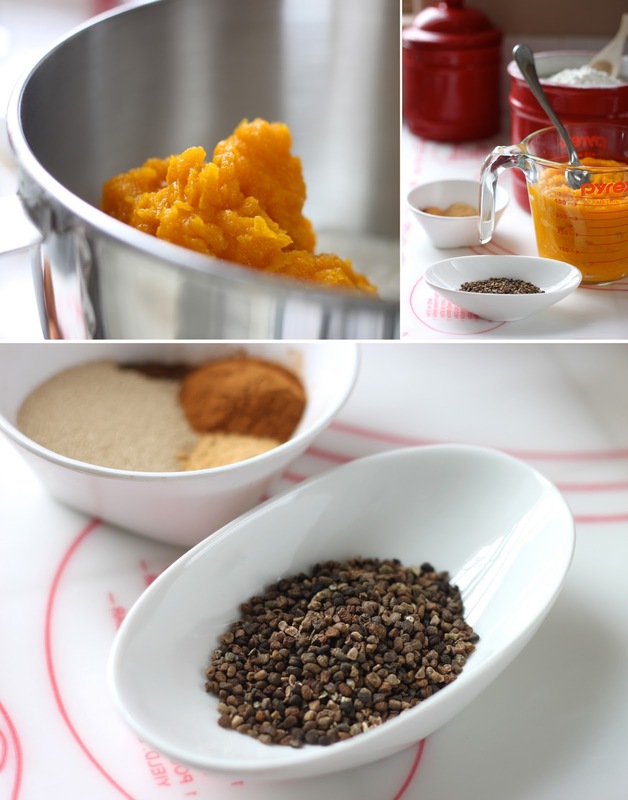 I have tons of fresh pumpkin puree, so Im definitely bookmarking this one! Your photography is beautiful too. Mmm, looks delicious! Good luck with the next round and happy thanksgiving, I hope you're not too sad to be away from your family. Since its just the two of us we're going to the Lodge at Torrey Pines for our dinner, I hope its good! Beautiful! The pictures at the beginning of your post especially are top-notch :) These recipes look wonderful, and a butter rum glaze is always a winner in my life. Enjoy Thanksgiving with your friend...Christmas is just around the corner! I'm sorry that you won't be able to spend the holidays with your family this year. However, it looks as though you are soothing your soul with some amazing treats. That bread pudding...oh my! I don't even know where to start! Your entire blog is so drool worthy! You have really just put me in the pumpkin loving holiday spirit! Amazing photos! You are so good. And the bread looks sensational. i dont know which sounds more delicious. the cinammon whipped cream or the butter rum glaze. These look simply divine! I'd say you knocked this one out of the park. Pumpkin perfect! So sorry to hear you won't be with your family for thanksgiving... I know how important family is as well. Congratulations as well on getting to the next round. I'll be voting for you! Mmm, can we come over for dessert? We'll bring some Port! I, too, spent the holiday without family :( but luckily in the company of some very nice friends. Hope you had a lovely Thanksgiving. Congrats on making it so far in PFB! I can't decide which recipe I like more - the bread or the pudding. Lovely photos; The braids in the bread look so beautiful. Good luck with this challenge! The bread pudding sounds delicious, but I have a question about the pumpkin in it. The recipe says 3/4 c. of pumpkin puree or a 15 oz. can, but there is a lot more than 3/4 c. in the can. Did you mean to put 1.75 c. of pumpkin puree? Hi Andrea! Thanks for noticing the discrepancy in the pumpkin amounts; I actually did mean to put 3/4 c. pumpkin, which is definitely not a whole can. Oops! :P I have fixed it now, good luck with the recipe and I hope you had a great Thanksgiving! Looks like it was worth all the work! I love the holiday spice/rum combinations of flavors and I'm not that into desserts. Good luck with Project Foodbuzz! PS: Where did you find a sugar/pie pumpkin in San Diego? Stop it! I'm salivating just looking at all of these amazing pictures. That buttered rum sauce... this is a contest winning post! Well done. You are amazing. Amanda: I find your Thanksgiving story very heart-warming: how you kneaded bread reminiscing your grandmother. Everything here looks so cozy and warm, and your photographs are lovely! I am not American by birth, but have been living in the US for 12 years so I am finally warming up to pumpkin...there is just so much to do with it. Great story, and yummy recipes. I love pumpkin, anything! Did I just read Pumpkin Pocket? Or Thumb Rocket?! Either way that tool (and your recipe) won me over! Cuisinerd: Haha, yeah that is a pumpkin scoop leftover from a Halloween pumpkin carving kit! It works wonders. And it actually says 'thumb pocket' just in case you dont know where to put your thumb, lol. Oh it also says 'Pumpkin Master.' Very cool. Your photos are stunning and this recipe sounds devine!! I love it! Beautiful descriptions, love the reason you went for the bread - I agree, it feels like home. :) you've got my vote! Well done...very nice post and entry. Good luck! Beautifully done. Love the photos! Best wishes. 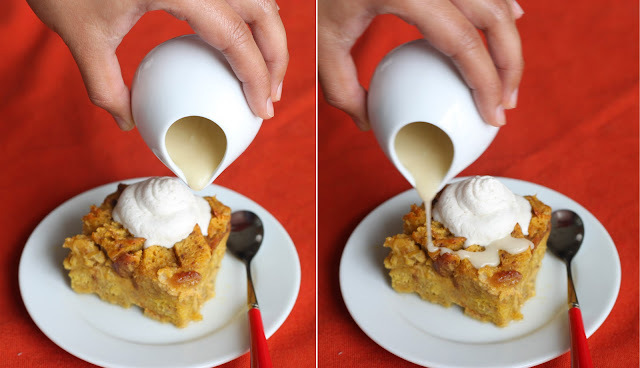 Great pumpkin recipes, I can't wait to try your pumpkin bread pudding, thanks so much. Just beautiful Amanda! I know how it feels to be away from friends and family for the holidays. I'm in the same boat. I'm glad you decided to bring home to you with this lovely recipe. You have my vote of course and good luck to you! My oh my, yes you do have me drooling. And voting! Excellent photography and what a beautiful dish! I love all the different suggestions for ways to use the bread ("7-way dress") LOL . .
Go ahead, toot, toot, toot! You can back it up. The bread and bread pudding both look wonderful! I am the lone bread pudding lover in my home or I would make this in a heartbeat. My husband wouldn't know what he's missing, I'm sure. Great job! I know I've already told you I love this, but I really really love this! My favorite part is that you made your own bread and then used it in the bread pudding. YUM! Great idea with the bread pudding. 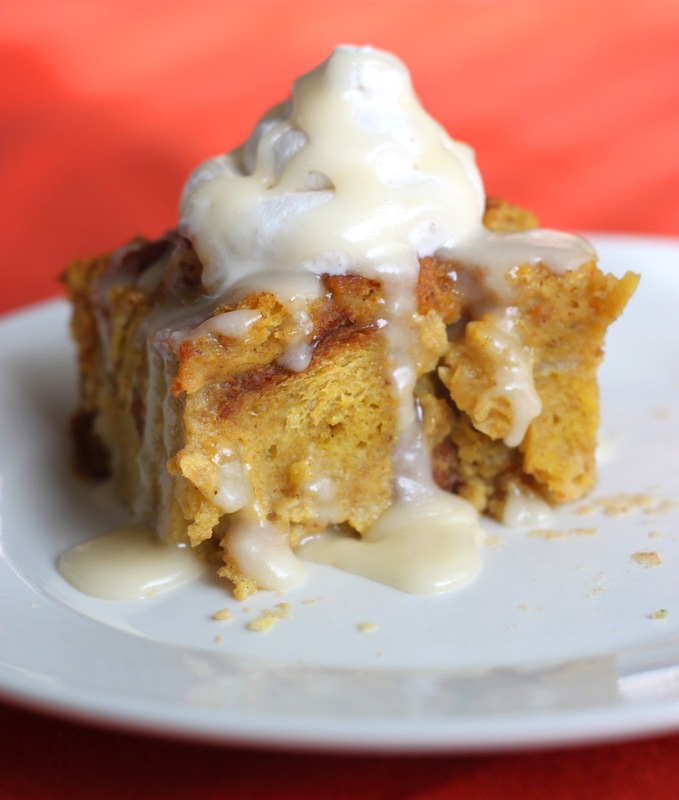 I really like bread pudding and I'm sure pumpkin just made it all the more moist. I would definitely celebrate Thanksgiving away from home, as long as I could have some of that bread pudding. :) Really nicely done. Great job Amanda !! I know what its like not to be home with family for the holidays. This looks delicious and that's coming from a non bread pudding fan :) Good Luck ! Beautiful, Amanda! This looks so yummy! Fantastic looking bread pudding! I love it that you took us through the whole process, from pumpkin roasting to pudding. Good luck this round! Oh how I love that you made yeasted bread! A girl after my own heart! Voted!! cait wait for the video update! and thank u so much for all the visual intake of your wonderful breads! yum yum! Beautiful, enticing entry. Wish I could lift it off "the page." Wow all that bread looks like a carb filled dream..! I will DEFINITELY keep an eye out for those videos, I would love to learn how to make bread look that beautiful. Then you went and made homemade bread pudding with homemade bread?? You have a lucky family, I bet they can't wait for you to show up with food like that! Also - Congrats on making it to another PFB stage! I'll definitely look for you in the next round. That amount of bread you've made can feed me for a whole month lol! Very well done! Deliciously scrumptious! You did your Omi proud, for sure! I totally know what you mean about that crazy yearning for a good yeasty bread (both working with and eating it) - your creations are just wonderful and I look forward to seeing you in the next round. Oh, and BTW, you totally made me laugh with your white tee shirt reference for the men - reminded me of my hubs. Wow - I love pumpkin, so I was excited to see what everyone would come up with this challenge. My hubby absolutely adores bread pudding (an addiction he passed on to me), so this is pure win. And I feel your pain about missing a holiday. Last year, I had to choose: Thanksgiving or Christmas with my family. I could only get off work for one, and my hubs's 10th high school reunion was the day after Thanksgiving. We spent our first married Christmas just the two of us, missing our families deeply, since neither of us had EVER missed Christmas. But, like you, I cooked to try and fill the void! It's not perfect, but it helps. I hope it helped you and warmed your heart a bit, even if nothing can replace family. You got my vote for this challenge! Congrats - you made it so far!!! Have a great week and good luck with everything! This was absolutely delicious! I used can pumpkin and a loaf of french bread just to cut down on the time. This was the best bread pudding I've ever had. My mom and husband loved it just as much! Thank you so much for the recipe. Good luck in the competition, I definitely voted for you. Wow Amanda, you even made you're own pumpkin puree! I really like how you demonstrated the versatility of the beautiful bread in the different forms/shapes you baked them in. Also, bread pudding has a big place in my heart, having it at Christmastime when growing up at home. Your Rum Raisin Pumpkin Bread Pudding with the sauce/icing drizzled on it looks absolutely luscious! Beautiful post, voted for you! 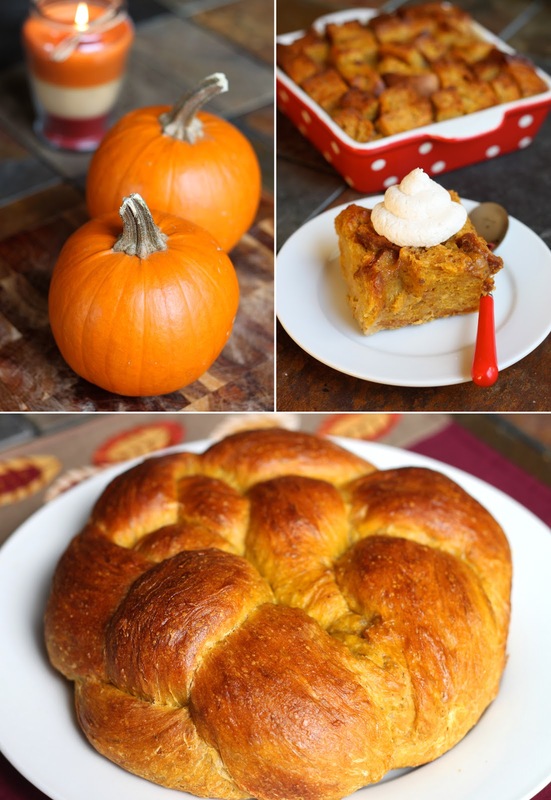 Your pumpkin bread looks so beautiful that it seems sinful to turn it into bread pudding! BUT - when you see the bread pudding... it was worthy! Beautifully illustrated post, you made the most out of your first "away-from-family" Thanksgiving. The bread looks absolutely amazing, and love that you made the bread pudding as well. Great job and good luck! Hi Amanda - great creative entry for the challenge, good luck, it looks positively delicious! What a beautifully written and photographed post (as per usual!) I have to admit that making bread has never gone well for me, but I'm willing to give it another shot if it means making this delicious bread pudding. Good luck! I've never read your blog before, but my goodness this recipe was calling my name from the foodbuzz website. فشركة تنظيف بالرياض تمتلك ما يجعلها رائدة في مجال تنظيف الشقق والمنازل والفلل والقصور والمكاتب وغيرها . I press the 'Q' button I ping a magical shield off three floating skulls, destroying them instantly. Pumpkin Sandwich Bread, and Voting is Open!